In the 2016 visual novel Ladykiller in a Bind, our suave protagonist is trapped. “The Beast,” as she’s code-named, must temporarily take the place of her twin brother, the Prince. All she has to do is survive seven days keeping her cover—on a cruise liner, containing all her brothers’ classmates, at a party celebrating the end of the academic year. Sounds like a ridiculous thing to do, but she has no choice. Her brother has her motorbike, which represents her freedom from the constraints of her domineering father and is integral to her image. So she must not be exposed as the Prince’s double. During the game, the player can always see how many “suspicion points” they and the Beast have incurred. If it ever reaches its maximum of five, the player has to start again from a save. But the Beast is not alone. Her first ally is The Beauty, who knows that the Beast is taking the Prince’s place and is willing to use her unique place in the ship’s social web to erase any suspicion the Beast has incurred at the end of the day. That is, provided the Beast helps her, too. Her other ally is the Stalker, whose relationship with the Prince begins as a mystery. However, the Stalker is easily more the Beast’s type than her brother’s. While the player can ensure that the Beast is as honest as possible, the Stalker never really finds out about the Beast’s identity until the end of the game. The Stalker cannot remove your suspicion; instead, she adds votes to the Beast’s total every night they spend together, as she is the administrator of the network that monitors the votes in the high-stakes game everyone on-board is playing. Ladykiller struck me on a very personal level. I’m a trans woman who is butch enough and scared enough that, while I am out in every other part of my life, I am not out at my workplace. Even coming out to my friends took incredible effort. Even though nothing bad happened when I came out to my friends, the fear of rejection still made it difficult. But at work the potential cost is higher: I know so many stories of trans women being harassed or slowly pushed out of their employment once they came out at work. So right now I have my own game sequence where I have to pretend to be the wrong gender during the day and can only be myself during the evenings. Like the Beast, I spend my days in disguise, with possibly dangerous consequences if I’m found out. When I played Ladykiller, I saw the duality of my own experiences reflected. The Beast would be lost without her allies. At the end of each day, the Beast can visit either the Beauty or the Stalker. Assuming the player wants to see all the events (and who doesn’t? ), you’ll have to play through the week seeing only the Beauty and then play again seeing only the Stalker. This ties into the ways the player is encouraged to play in each route. An ideal day on the Beauty route leaves the Beast just on the verge of being found out before she gets back to the Beauty, who can remove all her suspicion. Pushing yourself to the limit of all the nice things you can do in a day invokes a genuine feeling of relief when you make it to the Beauty at the end of the day. Similarly, the night events with the Stalker are free of any of the negative consequences that appear in routes available during the day. It’s a safe play space. The game takes advantage of that feeling to link to the Beast’s emotional state at the moment. The drop in tension, as well as entering into a scene where your choices now hold entirely positive consequences, creates the same shift in emotional intensity for the player as the Beast. That fear of being caught is always hovering over the Beast’s decisions. Suddenly having everyone turn on you for acting like yourself is something that can strike a chord with anyone, but particularly queer people. All of a sudden you mention a name or pronoun and someone you’re talking to turns on you in a second. 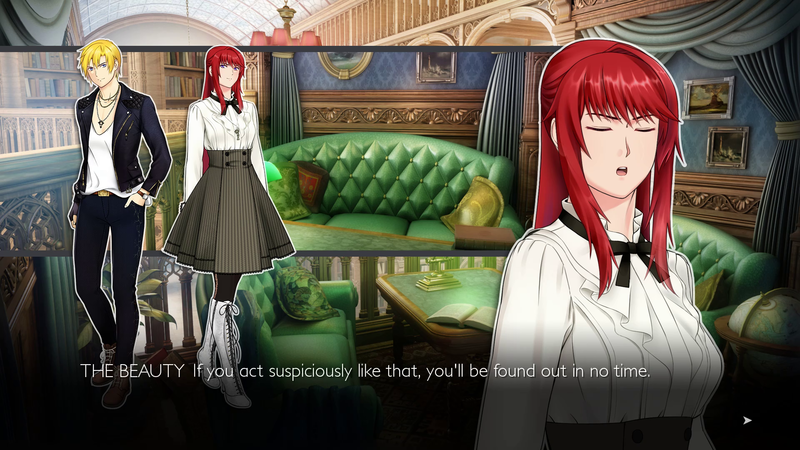 In the Beauty’s route, there is a moment where the player can have the Beast finally express how scared she is. And in the Stalker’ route, the Beast can express her frustration that even though she’s tried to be as honest as possible, the Stalker still doesn’t know her true identity. As a relatively butch woman (again, like the Beast), I don’t really have any external gender accouterments that I feel restricted from using for fear of outing myself. The only way to be “out” to my friends was to tell them. I came to realize how important it was to find a time to be with people who knew my identity. Not to dump my problems on them, but just to hang out in a space where I know I don’t have to double-check what I say about my life. I am aware that even having that is an immense privilege for a trans person, but it wasn’t until I was finally out with a few friends that I realized what a difference it made. This is what really saved me. The feeling of being closeted no longer follows me home. That’s what the story of Ladykiller gave me: a way to reckon with the duality of being a trans woman who has to work in the closet and to feel comfortable with my personal style—a style that doesn’t make it easy for me to be correctly gendered right off the bat. But that’s okay; I have people I care about who know who I am. I might still be trapped, but I don’t feel trapped anymore. Louise is a magician, writer and pod caster. You can find her on The LHC podcast and she is also a senior correspondent at Okazu.